The outdoor exhibit features original artworks designed specifically for this “living museum” of rare and endangered plants from Mediterranean climates. In Sharon Loper’s “The Raven and the Wolf,” two life-sized wolf figures skulk under the trees, possibly stalking their prey. Photo by Dan White. Visitors to Art in the Arboretum are welcome to choose their own pathways to see the artworks. Photo by Carolyn Lagattuta. Art installations blend creative works with the natural beauty of nature. Photo by Carolyn Lagattuta. Visitors can enjoy meandering journeys through the art installations, which beckon from the groves and invite guests to linger. Photo by Dan White. There are some curious new objects sprouting up among the trees, shrubs, and flowers at the UC Santa Cruz Arboretum: mysterious bronze wolves, giant eucalyptus leaves, and delicate ceramics. 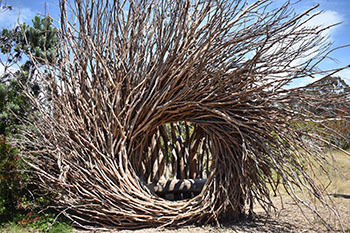 “Art in the Arboretum: Environmental Installations,” a collection of 11 artistic installations on an environmental theme, opened in May, and has been drawing crowds to the the vibrant 135-acre garden ever since, while drawing more attention to the Arboretum; visits are up 30 percent this year. The exhibit runs through November 17. The exhibit features original artworks designed specifically for this “living museum” of rare and endangered plants from Mediterranean climates. Before completing their installations, the artists walked through the gardens and got a sense of the space, said Susana Arias, local artist and curator of the exhibition. This creative experiment blends art with the natural beauty of nature, drawing visitors into under-visited sections of the park, including its New Zealand and South African groves. Some pieces are large and dominate the visual space, like Jayson Fann’s human-sized nest of eucalyptus branches. “Sequoia Semper Protea,” Wendy Domster’s contribution to the exhibit, is made from dozens of redwood branches that she collected after storms tore through the Santa Cruz Mountains last winter. The long branches curve upward, surrounding a circular metal stand, creating the illusion of an immense blossom in the middle of an open meadow. Other pieces are small and tucked among the plants, making visitors feel as if they have discovered these attractions on their own. 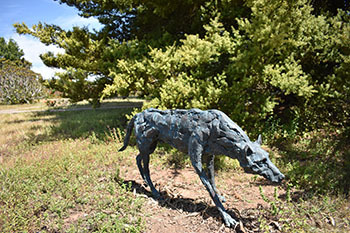 In Sharon Loper’s “The Raven and the Wolf,” two life-sized wolf figures skulk under the trees, possibly stalking their prey. Not far from the pair, midway up a tree, artist Larry Worley’s hand-dyed, rattan reed and driftwood shell captures the viewer’s attention. The artists drew inspiration from the natural features of the Arboretum. In Ethan Estess’s enigmatic piece “Gas Field,” pinkish globes bounce and sway with the breeze on thin steel stems; they bob and float in the wind like the plants around them. The piece blends in with its idyllic surroundings; this may come as a surprise, considering these orbs are old gas cans that Estess collected from a garbage dump in San Francisco. 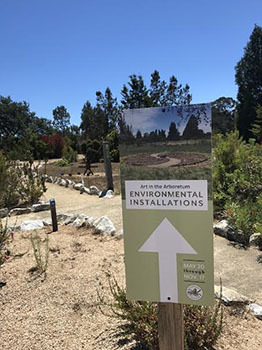 “I wanted to create an eye-catching, flower-like display that would reference the natural beauty of the Arboretum, yet also encourage visitors to contemplate our role in protecting ecosystems,” Estess said. Visitors can come up with their own pathways through the exhibit. They could start at the top of the hill in the South African garden, walking along the path in a counterclockwise loop toward the New Zealand groves. Or they might wander through the entire Arboretum, taking in each scene as it appears before them. “It’s best if visitors discover the installations without preconceived ideas about what to expect,” said Larry Worley, one of the contributing artists. Even the time of day has an impact on the experience. During a typical misty summer morning in Santa Cruz, the exhibits had a sleepy, serene quality. In that light, John Hylton’s “Suncatchers,” a set of three humanoid wooden figures, looked like a relic from an ancient time. As the clouds faded, the emerging sunshine added vibrancy to the scene. Jenni Ward’s “Umbel Series,” a curving path of electric yellow between patches of trees, is an especially fine installation for sunny days. The piece was inspired by a story of the Spanish settlers leaving trails of mustard seeds up and down the coast of California, creating an 800-mile path connecting the missions. There is more art on the horizon for the Arboretum, which is now in its 53rd year. 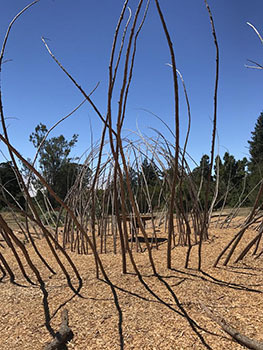 The Arboretum’s executive director, Martin Quigley, will soon team up with John Weber, founding director of UC Santa Cruz’s Institute of the Arts & Sciences, to bring an audio installation to the grounds. Additionally, pioneering eco-artists and professors emeriti of art Newton Harrison and Helen Mayer Harrison are planning an exhibit for the upcoming year. Meanwhile, visitors can enjoy meandering journeys through the art installations, which beckon from the groves and invite guests to linger. It’s as if each step heightens one’s awareness, while calling attention to the birds, shrubs, flowers, bugs, wind, and sunlight. Those elements are part of what make the exhibit unique, since they exert their own influence on the art’s appearance. “I encourage visitors to keep going back to the Arboretum to revisit the installations and see how time and weather alter the exhibit,” Ward said.